I believe we are all carefully guided by a "Higher Power." It doesn't matter whether you call that higher power "God," "Tao," "Krishna," "Allah," "Yahweh," "Ahura Mazda," "Great Spirit," "All That Is," "Spirit Guide" or any other name. What's important is that I've seen it in action many times throughout my life, so I know it's real. It often presents itself in the form of synchronicity: events that seem to conspire to accomplish some spiritual goal. In these cases, it feels as if "God" is using us as tools to accomplish spiritual work: we are literally God's hands. In June 2010, I was working on my fourth book, Answers Within, but I felt I needed someone to help me proof-read. 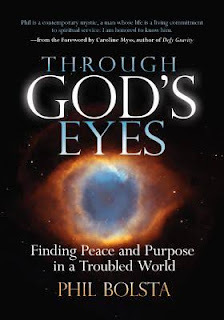 At the same time, my good friend, Phil Bolsta--who lives in California--was putting the final touches on his powerful book, Through God's Eyes and he needed a proof reader too. So I came up with this idea: I would proof-read Phil's book, and he would proof-read mine. We'd exchange a few chapters at a time so neither of us would be rewarded unless we both were. My progress on his book fueled his progress on mine. I called this idea "Mutually Assured Creation." Each paragraph of Phil's book is a quote from a famous person followed by an important spiritual lesson. For every quote, there's a lesson, and for every lesson, a quote. "Your spirit is the angel on your left shoulder, reassuring you that we are all perfect creations of God, that you already are everything you need. Spirit shares and is always content; ego takes and is never satisfied." "Phil, the second sentence is so powerful and poignant that I'd like to see it in its own paragraph, with a quote [from a famous person] of its own to support it." "Hey Phil! Read this and thought of you, so I always follow my intuition and am sharing it with you." Lori's quote from Hafiz perfectly fit the first sentence of Phil's lesson. Phil's original quote from Yogananda perfectly fit the second sentence. It was like "God" conspired to tell Phil--through me and Lori--to split the paragraph and to fill the prose with a perfect quote. Phil, Lori and I were all flabbergasted. I was deeply moved by these events and it sent shivers down my spine. It only took eleven minutes for "God" to bring three people together from three different parts of the world to make this happen. I literally felt like I was a spiritual tool, guided perfectly to this place and time. This has happened to me other times too. I remember one particular Tuesday evening Kathy and I decided to go play Bingo in the nearby town of Aitkin, Minnesota. When we arrived in Aitkin, we were a half-hour early. Kathy asked me what I wanted to do in the meantime. I thought about it for a moment, then said, [my brother-in-law Dan's mom] "Helen is in the nursing home in Aitkin, isn't she? Maybe we should drop by and say hi." So I turned around and drove a half-mile (~one kilometer) back to the nursing home. We went inside and asked for Helen's room. This was the one and only time we ever visited her. We walked into Helen's room and greeted her. She was smiley and warm, as always. I asked her how she'd been and she said fine, but she had a problem: Her laptop had stopped working a short time earlier, so she couldn't play her games. Without her laptop, she was bored and very frustrated. I'm a computer professional by trade, so it only took a couple minutes and I had the laptop working perfectly again. Soon our half-hour was up and we left for Bingo. But as I walked out the door, I was struck hard by that same feeling of synchronicity: Helen's laptop stopped working and as if by magic, "God" placed a computer professional--me--in her room without bidding, to fix it. I've never felt more "used," and yet more good inside. The next time Dan visited his mom in the nursing home, she had quite a tale to tell: Last Tuesday evening, her laptop stopped working. But strangely, enough, Bob and Kathy came in out of the blue and fixed it for me! 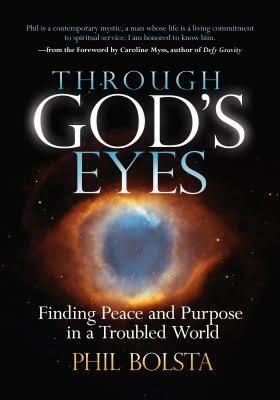 The message of Phil Bolsta's book is that we are more spiritually enriched when we learn to see life through God's Eyes. But I also believe we are God's hands. We just need to learn to pay attention to the guidance we're given, and act on it. "One of the most important books I've ever read. An incredible compilation of spiritual wisdom and insight. It's the owners manual God should give you when you're born." --Robert Peterson, author of "Out of Body Experiences"
Nice article written by author. If you have any problem regarding outlook you can contact us. We are leading third-party technical support services provider that gives the best support to the people who use technical devices like printers, antivirus software programs, and routers. We give the services through the well trained, skilled, experienced technicians who are certified by the best and well-known technology companies. Thanks for written nice informatics blog. i am really fan of your writing. i just write on article on outlook topic How to Create a Contact Group (Distribution List) in Outlook i Hope you will like it.